The recognition of a homozygous deletion of genetic material in a tumor genome has been instrumental in several tumor suppressor gene searches. The representational difference analysis (RDA) allows one to identify homozygous deletions even from among the high background of allelic losses that is typical for most cancers. RDA is a polymerase chain reaction (PCR)-based subtractive hybridization method. Two major obstacles to successful enrichment of target sequences from complex genomes were circumvented by RDA. Incomplete reassociation of complex DNA populations is overcome by using representative subpopulations of the tester and driver genomes. In addition, reiterated hybridization, selection, and amplification of the difference products introduces a kinetic component in the enrichment of target sequences. RDA thus enables the identification of homozygous deletions as small as 100 kilobases. 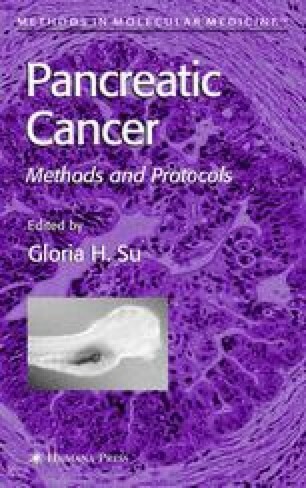 Here, we provide a detailed protocol of the RDA procedure, including reflections on frequently encountered technical problems and on the particulars of its application in cancer.